Can I get a Holy Haleakala! from the congregation? Wow. I mean seriously, wow. You really really want to go look at the embiggened version. What you’re seeing here are sand dunes on Mars. This region is in the center of a large crater at mid-north latitude on Mars, a couple of hours past local noon, and with a resolution of 50 cm (18 inches) per pixel. Sand dunes are common in crater beds, where the wind can blow steadily across the surface and sculpt the ever-present sand into those flowing sculptures. But what this picture so spectacular are the graceful blue-gray swirls arcing across the dunes. These are caused by dust devils, which are a bit like mini-tornadoes. If the ground gets heated, rising air can punch through cooler air above it. This starts up a convection cell, with warm air rising and cool air sinking. If there is a horizontal wind the cell can start spinning, creating a vortex like a dust devil. I’ve seen hundreds of these on Earth, and they are wonderful and mesmerizing to watch. The important thing to note here is that the sand in the craters of Mars is actually dark grey in color, since it’s made of basalt. The reason it looks red in pictures is because covering the sand is a thin layer of much finer dust, and the dust is what’s red. 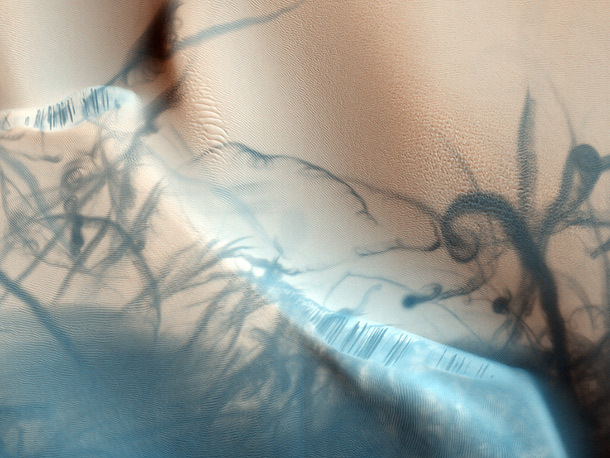 When a dust devil moves over the Martian surface, it can pick up the very light dust particles, but not the heavier sand grains. So those blue-grey swirls are tracks where the dust devil has vacuumed up the dust, revealing the darker sand underneath. If you look carefully in the tracks, you can see the sand dune ripples are undisturbed. Only the dust is gone. There’s more to see in the picture as well. There is a sloping dune peak cutting across from top left to lower right (it’s more obvious in the larger context view of this region), and again more dark streaks, linear this time, probably caused by sand sliding down the dune face. When the sand moves, the dust covering it gets disturbed and once again you see the darker color of the sand itself. I also love the way the dune shapes change depending on where they are in the picture, caused by differences in the wind patterns across the floor of the crater. When I look at pictures like this, I am smacked in the face with the cold, hard fact that Mars is a world. It’s not just a dot in the sky, it’s not just a set in a movie, it’s not just pictures from a space probe. It’s a planet, a vast complex system of interacting environments which produces climates, landscapes, vistas, weather. And man oh man, does it produce beauty, awe, and wonder. Wow. My thanks to Dr. Alfred McEwen of HiRISE for taking the time to explain to me the difference in color between the dust and the sand, and how that affects this image.